Toronto-Dominion Bank, through its subsidiaries, engages in the provision of retail and commercial banking, wealth management, and wholesale banking products and services in North America and internationally. It operates through four segments: Canadian Personal and Commercial Banking, Wealth Management, U.S. Personal and Commercial Banking, and Wholesale Banking. This international dividend achiever and Canadian Dividend Aristocrat has raised dividends for 15 years in a row. Over the past decade this dividend growth stock has delivered an average total return of 13.20% annually. The company has managed to deliver a 5.60% average annual increase in its EPS between 1999 and 2008. Analysts expect Toronto-Dominion Bank to earn $4.98 share next year, followed by a 4% increase to $5.17/share in the year after that. 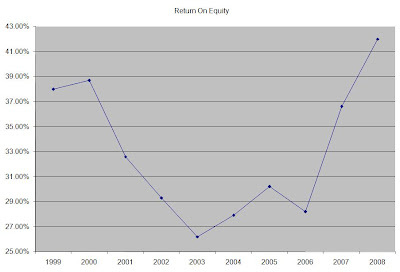 The Return on Equity has recovered from its 2003 lows of 26% and is at a very impressive level at 42%. Rather than focus on absolute values for this indicator, I generally want to see at least a stable return on equity over time. 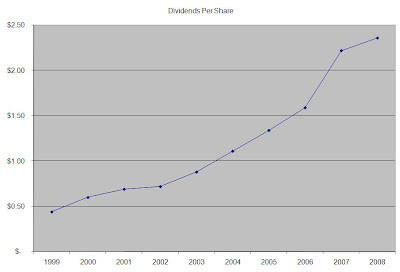 Annual dividends have increased by an average of 20.50% annually since 1999, which is higher than the growth in EPS. Most of the dividend growth came from the expansion in the dividend payout ratio, which more than tripled from 15% in 1999 to 48% in 2008. A 20 % growth in dividends translates into the dividend payment doubling every three and a half years. If we look at historical data, going as far back as 1973, Toronto-Dominion Bank has actually managed to double its dividend payment every six years on average. 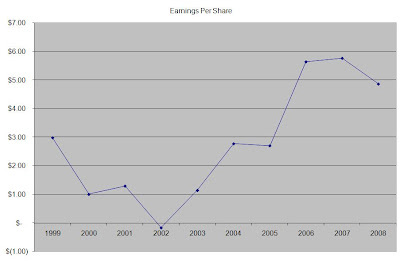 The company last raised its dividends in 2008. 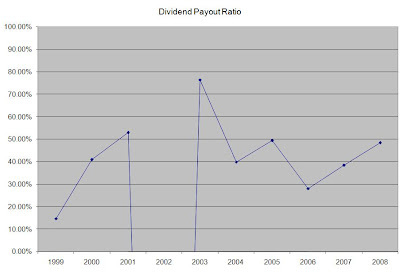 The dividend payout ratio has more than tripled from 15% in 1999 to 48% in 2008. In 2002 the company lost money, which is why it is at zero for the year. A lower payout is always a plus, since it leaves room for consistent dividend growth minimizing the impact of short-term fluctuations in earnings. Currently the Toronto-Dominion Bank is attractively valued at 17 times earnings, yields 3.50% and has an adequately covered distribution. The main issue with this dividend investment is that it has failed to increase its distributions for five quarters in a row. The company has until the last quarter of 2010 to raise its dividend, or otherwise it would lose its dividend achiever status. In the meantime it is a solid hold for me. That is unless you are looking for some exposure to the financial sector for your dividend portfolio. As such TD could be a nice small starter position to consider.